BRIGHTON DOME on a Tuesday night. I could think of a lot worse places to be. 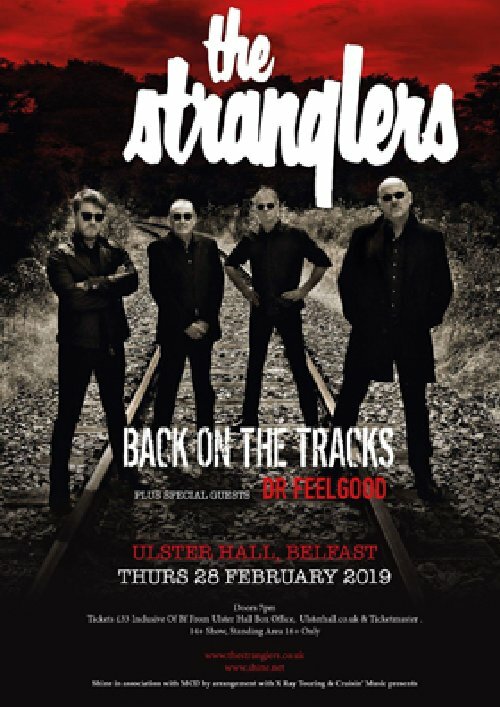 This venue is a beautiful setting - lovely staff too - and a perfect way to spend a Tuesday watching The Stranglers on their Back On The Tracks tour of 2019. The two front men look like they are having a ball and is infectious. There's a fresh new retro backdrop of a slimy sewer with extractor fans. Plus there are some new additions to the set list: Ice Queen is a contender for a share of The Raven royal lineage. It sounds so cool and crisp and I prey it remains in the live set. Unbroken too, sounding as fresh as the day JJ played us the pre-released Suite XVI. Similarly I've Been Wild off Norfolk Coast is another good song to do. Plus, they have not been afraid of switching the set around throughout the tour. Baroque Bordello is simply sublime, and we all love Something Better Change and 5 Minutes. We all love Duchess, Walk On By, Hanging Around and No More Heroes too - and Always The Sun, Peaches and Golden Brown all sound really good here. Everything is expertly played and the vocals come across with stunning clarity. 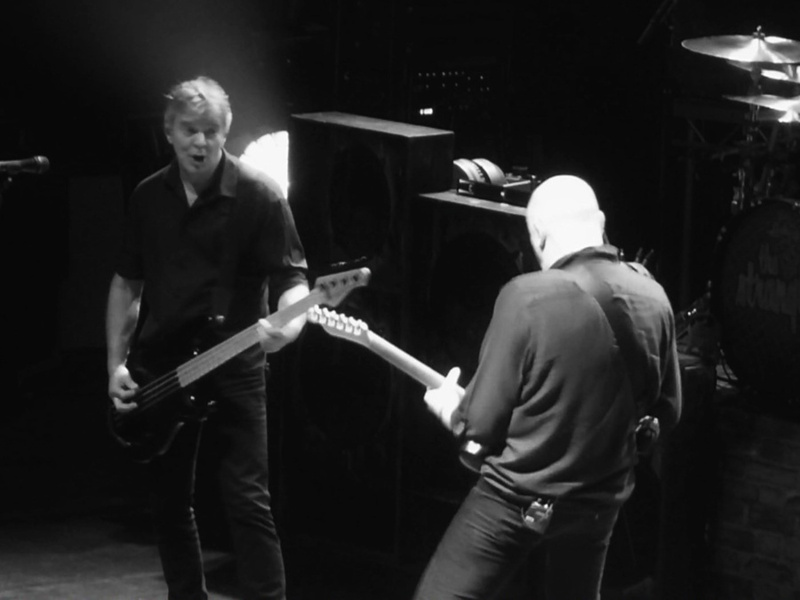 There's power in the bass too, as well as Jim's fine drumming. Uptown is okay but not really needed, as there are plenty other tracks more deserving. Same for Bring On The Nubiles. 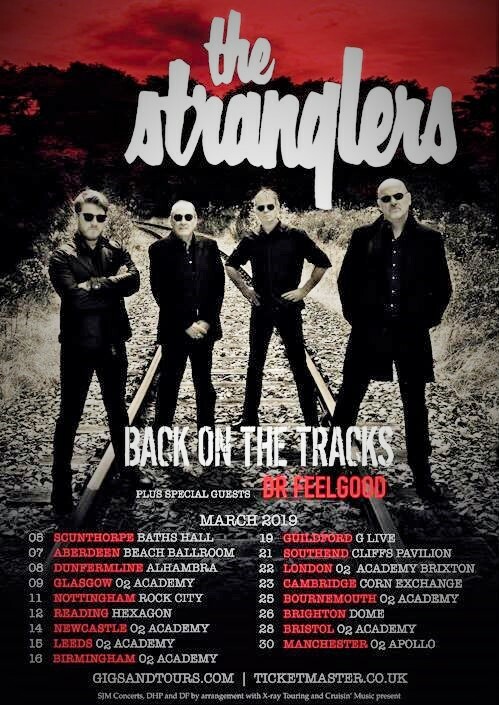 Stranglers fans are a fussy lot when it comes to the live set, and some are never satisfied perhaps. But long-term fans like me are always thankful the band has successfully played on and evolved and for that we are truly grateful. Hey! (Rise of the Robots) is always a great live track since they rediscover it for the Black and White Convention at King's Cross, and opener Tank is always a welcome blast. Down In The Sewer too. Brilliant. However, while new songs may be works in progress, they are not that easy on the ear. I'm glad they didn't do Water, as I've never really got into it. Instead it 's Man On The Moon, as well as Payday, a track which isn't currently suiting the live voice of Baz. The same for Uptown. Mildly pernickety I know, but I'm sure I echo the general train of thought for the majority particularly from the others I speak with tonight. The band welcome positive criticism, allegedly. The other new song - a cover from Disciples of Spess - is This Song. It is a perfect gift for the Stranglers and their continually good occasional cover versions. This Song is their song and fits into the night perfectly. Great crowd and a thoroughly enjoyable night with the Men in Black once again. Review by Gary Kent. Photographs by Andy Miller. Corsican! Boom, boom... Yes, Thursday 25th July 2019 is when the band visit the beautiful Mediterranean island of Corsica for the first time. 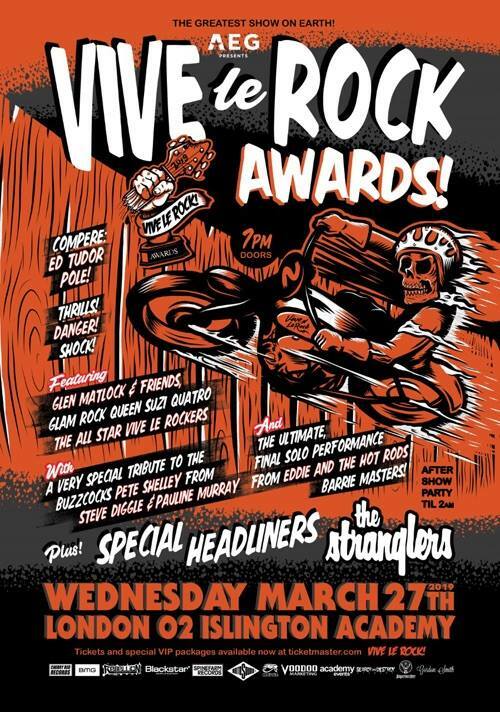 Also, Vive le Rock is coming up soon in London. 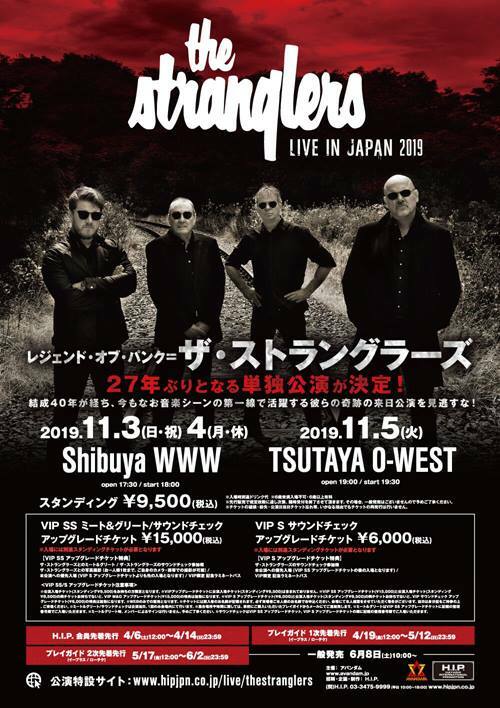 Plus there's an Amsterdam date too in December - and a long overdue return to Japan for a trio of dates also in December. More details on the official site. 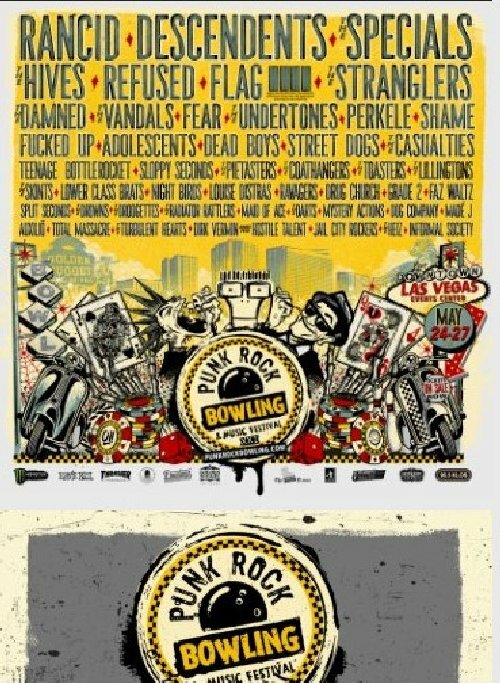 Please note: May's Punk Rock Bowling in the US is already a sell-out. 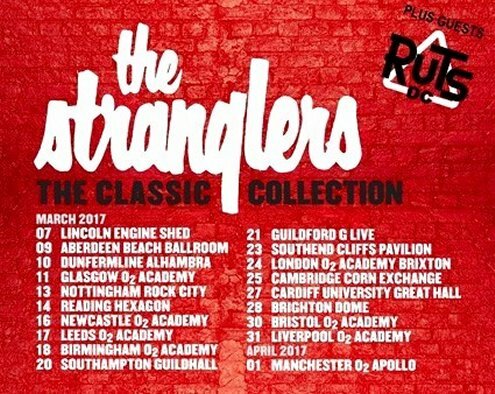 However, Blackpool's Rebellion has The Stranglers for the first time, and tickets will go quickly. For ticket details, including more summer festivals and new December gigs, go to the official site. The Stranglers have just announced their March 2019 "Back On The Tracks" tour, with 19 gigs across the UK and Ireland. Full details on the official site. 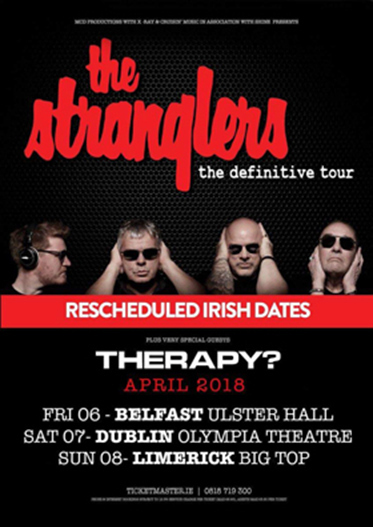 As The Stranglers' UK Definitive Tour draws to a close, those cancelled Irish dates are now rescheduled for April. Plus new Summer festival dates have been announced for UK, Israel and France. 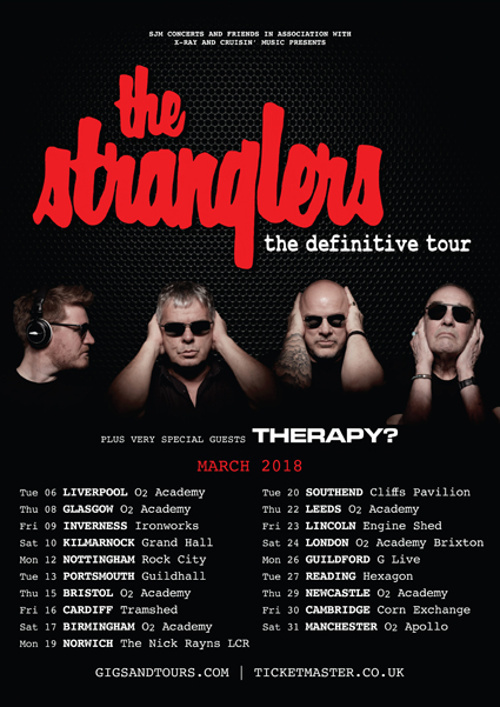 The Stranglers have just announced "The Definitive Tour" of the UK in March 2018 with 19 gigs across the country. Tickets go on sale 15th September at 9am. Glasgow's May West Festival is cancelled but there's a new date in Belgium on 29th July. 15th May - iUna Noche En La Movida! Festival, Wizink Center, Madrid, Spain. 24th June - Retro C Trop Festival, Tilloloy, Somme in Nord-Pas-de-Calais, France. 1st July - British Summertime Festival, Hyde Park, London, UK (with The Damned, The Hives and Green Day). 7th July - Godiva Festival, War Memorial Park, Coventry, UK (free). 21st July - Bands in the Sands Festival, Perranporth Beach, Cornwall, UK. 29th July - Hopital Notre Dame A La Rose, Lessines, Belgium (with Buzzcocks and the Bollock Brothers). 26th August - Custom House Square, Belfast, NI (with Stiff Little Fingers and Ruts DC). 17th September - Head for the Hills Festival, Ramsbottom Cricket Ground, Acre Bottom, Lancashire, UK. 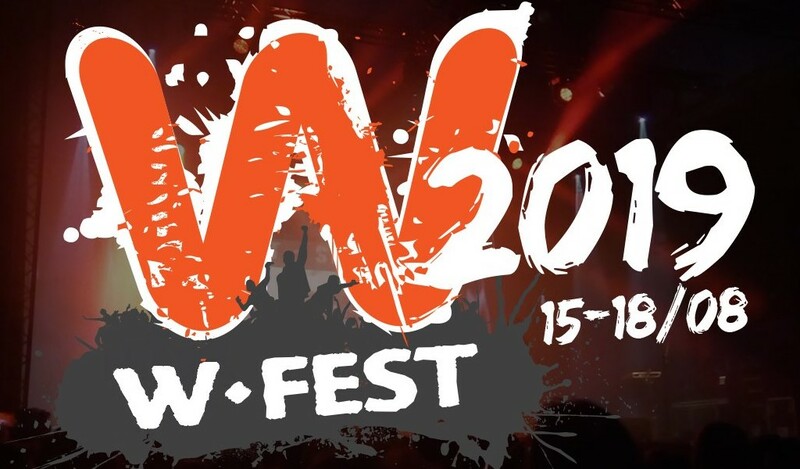 27th May - May West Festival, Glasgow Green, Glasgow, UK. Keep up to date via the official site or the Strangled facebook page HERE. 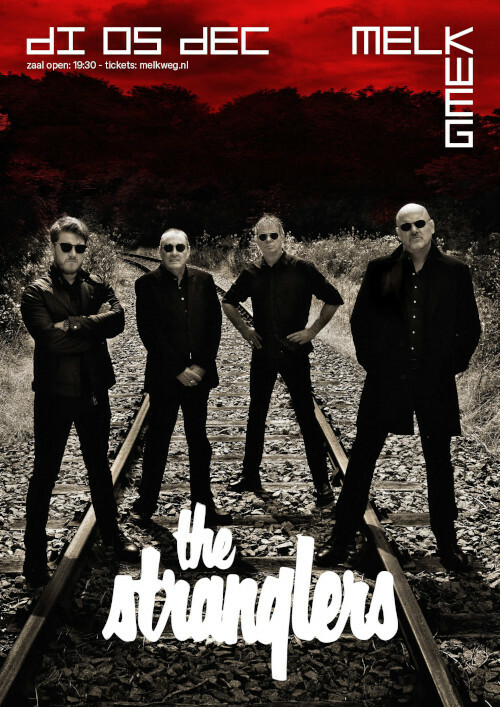 The Stranglers are strangling classically and collectively way down under in 2018: the band return to Australia and New Zealand for the first time since 2016 in February next year with seven dates. Tickets are on sale now. 27th May - May West Festival, Glasgow Green, UK. 21st July - Band in the Sands Festival, Perranporth Beach, Cornwall, UK. 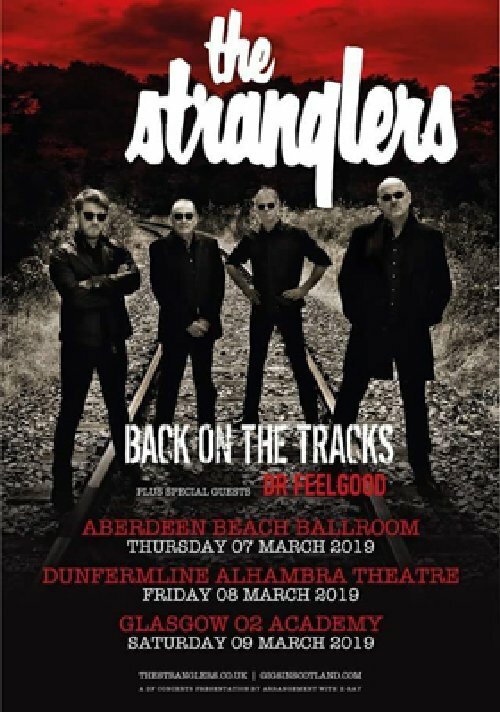 The Stranglers 'Classical Collection' Tour of the UK begins at Lincoln and tickets are already going fast with sell-outs at Aberdeen, Glasgow, Cambridge and Liverpool. 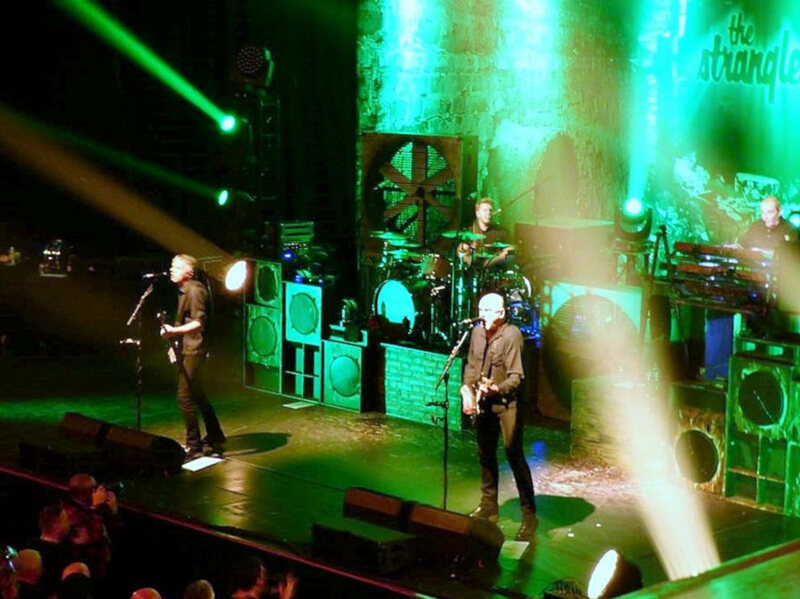 Dazzling dub-punks Ruts DC are in support, so make sure you tear yourself away from the bar to catch them. Not to be missed. 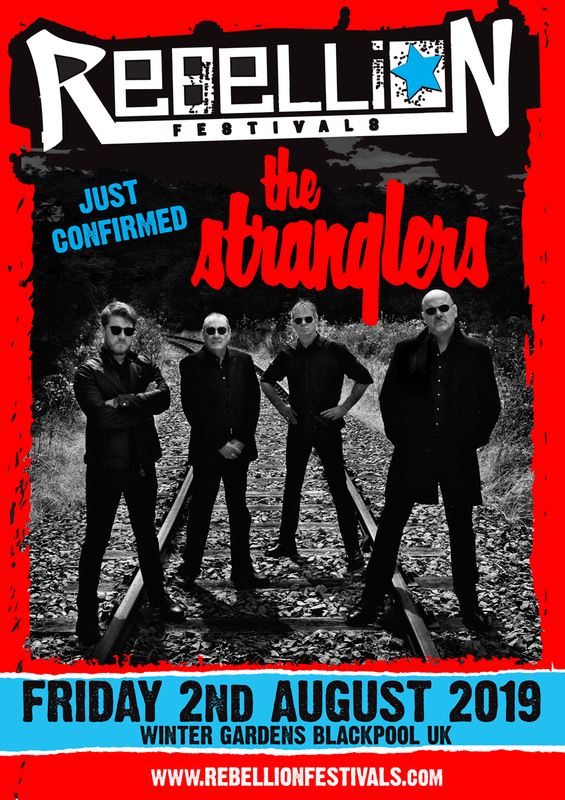 Further dates for the summer have also been announced: on July 7th The Stranglers play a free gig at Coventry's Godiva Festival and rumours of the band arriving at the War Memorial Park naked on horseback are unfounded. On 26th August, the band play at Custom House Square in Belfast with Stiff Little Fingers who are celebrating their 40th anniversary and tickets are on sale now.